Kinematics, the study of motion, is employed in numerous biomechanics and human performance investigations. The types of instrumentation used in these studies vary at fundamental technical levels, making it difficult to relate results from studies carried out at different laboratories using different instrumentation. A project was designed to compare two commonly used types of kinematic recording techniques, i.e., the 6 df electromagnetic tracker system and the video motion analysis system. A four-level testing and comparison method was conducted involving static and dynamic inanimate objects, as well as human subjects under static and dynamic conditions. It was demonstrated that for rigid body inanimate objects the two systems produce nearly identical values under stationary conditions and are comparable under moving conditions. The systems show only trivial discrepancies in static human body measurements, and perform in qualitatively similar ways on human motion. KEY WORDS: Kinematics; electromagnetic tracker; video motion analyzer; reaching. Kinematics, the study of motion, is employed in numerous biomechanics and human performance investigations. The types of instrumentation used in these studies abound, and vary considerably at fundamental technical levels. An early review of recording systems for biomechanical analysis is found in Ayoub.0) A later comparative analysis of kinematic measurement systems given in Tyson and Das. (2) Such a variety of devices makes comparisons among studies conducted at different laboratories with different instrumentation difficult, and limits the usefulness of the results. 2Computerized Biomechanical Analysis, Trabuco Canyon, California. 3MOCO, Inc., Scituate, Massachusetts. 'Mathematics and Computer Science Department, University of Massachusetts-Boston, 100 Morrissey Boulevard, Boston, Massachusetts 02125-3393.
analysis. The question arises as to whether the results of studies employing these different types of devices are compatible. Thus, a comparison of the performance of the two types of systems should prove to be of general value. The first category of systems consists of electromagnetic trackers. (3-7) These provide the 6 df of a moving sensor relative to a fixed source, employing technology that uses low frequency magnetic fields to make these measurements. These systems record angular information directly, with sensors that are attached to the skin surface. There can be slippage of the sensors, particularly in the twist motions, problems can arise due to interference from metal in the environment, and there can be delays due to filtering. The second category, video motion analyzers, is made up of two- and threedimensional human performance systems. (8,9) Body segment points are located with retroreflective spherical markers attached by double-sided tape, and the systems automatically track these markers through successive frames, assuming adequate background contrast. Each camera sees a marker in two dimensions; a marker must be in the field of view of at least two cameras simultaneously in order for its threedimensional location to be calculated. In some systems, if a marker becomes occluded, the system automatically supplies the missing point by interpolation. Typically, system resolution and accuracy are high. Software for data capture, threedimensional calibration, computation of the three-dimensional coordinates of the target markers, interactive graphics for plots and stick figures, statistical routines, and signal processing is often available, and data reduction is rapid. Some of these systems demand a controlled environment, since the system requires multiple electrical outlets, a room with a matte finish, heavily draped windows, and fluorescent light. An optional feature in some of the systems is that it is possible to record without markers and then manually digitize each frame; the trade-off, however, is that the operator must locate joint centers. As a compromise, some systems allow points of interest on the subject to be tracked semi-automatically without markers, requiring that the operator initially identify the desired points; the system then predicts the location of these points in subsequent frames. Instrument Comparison A project was designed to compare these two commonly used types of kinematic recording techniques, i.e., the 6 df electromagnetic device and the video motion analysis device, in guided limb motion tasks. The specific member of the former group that was selected was the Ascension Flock of Birds (FOB), and the Ariel Performance Analysis System (APAS) was chosen from the latter group. The goal was to determine how close these two very different types of devices operate, and whether the results obtained from one system could be compared with the results from the other. There are several possible sources of measurement errors or differences for the two systems, particularly in applications involving human subjects. They could be caused by system setup, sampling rate, resolution, accuracy, receiver and marker attachment to the body, and receivers and markers moving with the skin surface. Digitizing errors and magnetic field corruption contribute additional complicating factors. To isolate the possible different causes, a four-level testing and comparison method was conducted involving static and dynamic inanimate objects, as well as human subjects under static and dynamic conditions. subsequent processing. The system permits frame grabbing, frame retrieval, data compression, smoothing and filtering options, and zooming. Viewing and graphing modules for the digitized activity, measured or computed, are available. Two variable shutter cameras were used in this project, each operating at 60 frames per sec. Several types of reflective markers were used to assist in identifying the points of interest: a finger cot with reflective tape, large and small reflective balls, and a splint with a small reflective ball attached to each end. Selected points were digitized in each frame, producing the Y, y, and z translation trajectories, i.e., the location of each coordinate over time, of the points. A formal protocol was developed to permit comparison of the two systems. System performance was examined at four levels, each increasing the difficulty of obtaining system compatibility. The first level, termed static inanimate, was to determine the x, y, and z translational distances between two fixed points, the fixed flexion angle formed by a goniometer, and the fixed twist angle displacement made by a goniometer. In the second level, dynamic inanimate, trajectories were obtained for the three translation signals of a randomly moving point, the randomly changing flexion angle formed by two rods, and the randomly changing twist angle produced by a rod. For the third level, static animate, a human subject held his or her arm in various fixed positions intermediate to a functional reach; the three translational distances between selected body landmarks, joint flexion angles, and angles formed by body segments and the coordinate axes were obtained. At the fourth level, dynamic animate, the human subject made simple functional reaches; the x, y, and z translation trajectories of selected body landmarks, joint flexion and twist angle trajectories, and trajectories of angles formed by body segments and the coordinate axes were acquired. 443Instrument Comparison Levels III and IV were conducted with human subjects. No attempt was made to control for age, gender, handedness, stature, or weight, since the objective was simply to compare data simultaneously acquired by the FOB and the APAS. Informed consent was obtained from each subject prior to the start of any testing. Level I.A was to use the FOB and the APAS to calculate the Y, y, and z translational distances between two fixed points. An APAS large reflective ban was attached to the top of each of two FOB receivers, and the two marker/receiver combinations were set at oblique x, y, and z distances. The x, y, and z distances were measured three times in short succession with a steel measuring tape, calculated for each sample acquired by the FOB during the 6-sec data collection interval, and calculated for each frame acquired by the APAS during the six-second data collection interval. Three trials were made, with the marker/receiver combinations placed in different locations each time. Level I.B was to calculate the fixed flexion angle formed by a plastic full-circle universal goniometer. An APAS large reflective ball was attached to the top of each of two FOB receivers. One of these was placed at each arm end of a goniometer, and one APAS large reflective ball was placed at the vertex of the goniometer. The goniometer was set to an arbitrary angle. The goniometer angle was read three times, and was calculated for each FOB sample and each APAS frame during the 6-sec collection interval. Fourteen trials were made, with the goniometer at different angles and in different states of rotation and tilt relative to the APAS cameras. Instrument Comparison from a seated position were used. All reaches were made at natural speeds, as established by the subject. The basic reach consisted of a decision to access a target in the workspace, followed by visually locating the target, and then using visually guided motion to bring the arm naturally to a successful access of the target. During the reach, the torso remained stationary and against the chair. The proximal end of the clavicle was fixed, meaning that it did not translate. Clavicle, shoulder, elbow, and wrist motion was allowed. Accuracy was important, reaction time was not, and movement time was whatever was natural for the individual. The initial position was with the upper arm perpendicular to the ground, the elbow at 90 degrees, and the forearm midway between pronation and supination. 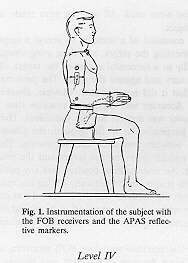 The final position was with the pad of the middle finger on the target and the palm facing away from or toward the subject. An intermediate position was any position between the initial and final positions that occurred naturally during the reach. The forward distance of all targets from the shoulder was the same and was determined as follows. It was the distance at which the shoulder had to be placed from a point that was 16 cm above and laterally aligned with the shoulder to induce full arm extension to touch the point. The following calculations were made from both the FOB and APAS data, using all samples or all frames of the 6-sec data collection interval. The x, y, and z translational distances between each adjacent pair of FOB receivers was calculated. Wrist flexion/extension, wrist radial/ulnar deviation, and elbow flexion/extension angles were also calculated. Finally, the upper arm X-axis angle, upper arm Y-axis angle, and upper arm Z-axis angle were calculated, these being defined relative to an inertial moving coordinate system, with origin that was attached to and moved with the shoulder at the acromion and axes that remained directed as and parallel to those of the FOB transmitter. Fig. 1. Instrumentation of the subject with the FOB receivers and the APAS reflective markers. Level IV consisted of a human subject making a simple three-dimensional functional reach. The basic reach, targets, and instrumentation were as defined for Level 111. The reach was made during the 6-sec data collection interval. During this interval, the x, y, and z translation trajectories of the end effector, wrist, elbow, and shoulder were obtained. Trajectories for the wrist flexion/extension, wrist radial/ulnar deviation, forearm pronation/supination, elbow flexion/extension, upper arm Xaxis, upper arm Y- axis, upper arm Z-axis, and shoulder medial/lateral rotation angles were also obtained during the 6-sec interval. 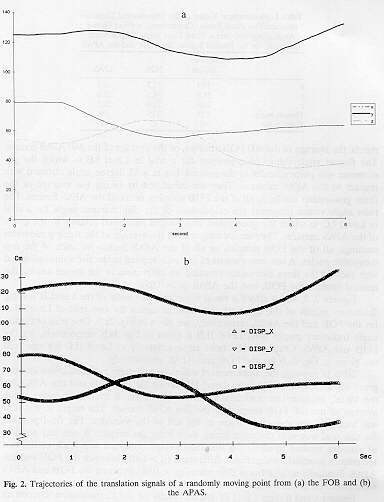 Graphs for all trajectories during the actual movement time, i.e., the time from the initiation of arm movement to the touch of the target, were produced. Eighteen targets, differing in location or final position required, were used. Several types of analyses were performed on the data acquired with the manual system, the FOB, and the APAS in the four-level testing. It was necessary to limit the number of trials for incorporation into the analyses because the APAS data were manually digitized which is an extremely time-consuming process for this type of application. Representative trials were randomly selected from each level or sublevel. Y, y, and z translation signals for one trial of Level II.A for the FOB and the APAS, respectively, are given in Fig. 2a,b. One trial of flexion angle trajectory graphs from Level II.B is given in Fig. 3a,b, respectively, for the FOB and APAS. Graphs of the twist angle trajectory at Level II.C for one trial are given in Fig. 4a,b for the FOB and APAS, respectively. Table Il contains the measurement values (centimeters for translations and degrees for angles) obtained from Level III testing for the FOB and the APAS for the initial, intermediate, and final positions of one reach trial. Each value is the average of the 600 FOB samples or the 360 APAS frames. The target in this trial was located 8 cm above and 8 cm to the left of the shoulder. The final position for this trial was with the palm facing away from the subject. A one way analysis of variance applied to all of the translation values obtained with each of the two techniques revealed no significant differences (p > 0.05) between the FOB and the APAS. Similarly, no significant differences (p > 0.05) between the FOB and APAS were observed for the angle values. Figures 5 and 6 show Level IV testing results for the 12 translation trajectories and the eight angle trajectories. Graphs for one trial from one subject are shown in Fig. 5a-d for the FOB translations and angles and the APAS translations and angles, respectively. The target in this case was located at shoulder level and 16 cm, to the right of the shoulder, with a final position of the palm facing toward the subject. Figure 6a,b, respectively, for translations and angles, shows this same trial as the FOB values plotted against the APAS values during the movement time. Specifically, for each point during the movement time of the reach, each of the 12 APAS translation values is paired with the corresponding FOB translation value and all pairs plotted on the same graph; similarly, for each sample, the eight APAS and corresponding FOB angles are paired and plotted on a second graph. 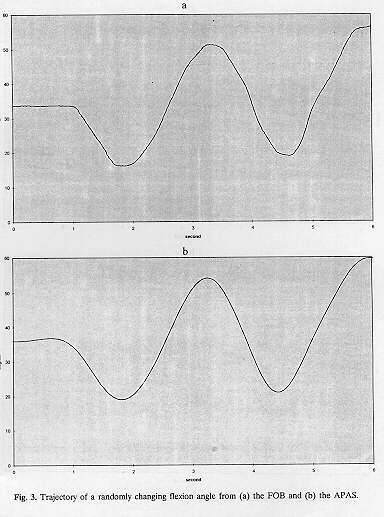 These graphs offer a further examination of the similarity of the two systems, in that the closer the data points in the graphs can be fitted by a straight line with slope 1, the more alike are the values of the two systems. Fig. 2. Trajectories of the translation signals of a randomly moving point from (a) the FOB and the APAS. ments, the average of the 600 FOB samples, or the average of the 360 APAS frames. The flexion angle values (degrees) are for a trial in Level I.B in which the goniometer was perpendicular to the ground, but at a 45 degree angle outward with respect to the APAS cameras. They are calculated by taking the average of the three goniometer readings, all of the FOB samples, or all of the APAS frames. The twist angle values (degrees) are calculations of the displacement angle for a trial in Level I.C in which the goniometer was rotated and tilted relative to the plane of the APAS cameras. They are calculated from the average of the three goniometer readings, all of the FOB samples, or all of the APAS frames for each of the two composite angles. A one way analysis of variance applied to the five values obtained with each of the three techniques revealed no differences in the means among the manual system, the FOB, and the APAS (p > 0.05). Figures 2, 3, and 4 afford a visual inspection of results of the Level II testing. Trajectory graphs of the x, y, and z translation signals for one trial of Level ILA for the FOB and the APAS, respectively, are given in Fig. 2a,b. One trial of fleidon angle trajectory graphs from Level ILB is given in Fig. 3a,b, respectively, for the FOB and APAS. Graphs of the twist angle trajectory at Level II.C for one trial are given in Fig. 4a,b for the FOB and APAS, respectively. Fig. 3. Trajectory of a randomly changing flexion angle from (a) the FOB and (b) the APAS. Fig. 4. Trajectory of a randomly changing twist angle from (a) the FOB and (b) the APAS. Table H. Measurement Values of the Translational Distances (Centimeters) and Angles (Degrees) at Three Positions of a Functional Reach for the FOB and the APAS. The FOB and the APAS have been compared under different conditions of operation. In Level I, it was possible to evaluate these two instruments against traditional devices used in conventional anthropometry, namely, the steel measuring tape and the plastic goniometer, thus allowing the results to be considered with respect to commonly accepted actual values. In general, however, since there are no standard kinematic instruments with which to validate the results, this study investigates how close the performances of the FOB and APAS are to each other, rather than how close either is to the true physical measurement. measured by the FOB. Furthermore, the anatomical angles do not correspond to the Euler angles that are directly collected by the FOB, and must be calculated, often from more than one receiver; slight misalignments, can impact on these calculations. With regard to the APAS, misses in the location of the joint center on the limb segments, with either manual or automatic digitizing, will influence the angle measurements. Finally, for the FOB, the joint angles are calculated from angle values, whereas for the APAS they are calculated from positional values of the vertex and sides of the angle; thus, numerical discrepancies might be expected to arise from the mathematical calculations. At Level IV, the full array of complicating factors inherent in the human body are present. Issues such as skin rotations, muscle activity, and tissue masses all have the potential to contribute errors in the acquired data and challenges to system compatibility. From the graphs, it can be observed that the shapes and displacements of corresponding signals are quite similar. The reliability coefficients indicate that overall the systems produce close results for both translation and angle trajectories. It may be concluded that the electromagnetic tracker and video motion analysis systems perform closely enough on static inanimate objects to allow quantitative data to be compared, and permit dynamic inanimate objects to be compared qualitatively. The systems present no problems for the static animate case, and can be used interchangeably. Qualitative comparisons can be made in the dynamic animate case, and for studies interested in basic trajectory shapes and displacements the two systems are demonstrably comparable. The authors wish to thank Dr. Gideon Ariel for his extensive technical assistance in adapting the Ariel Performance Analysis System for this study. This work was supported by NASA contracts NAS9-18514 and NAS9-18915. 1. Ayoub, M.M., Human movement recording for biomechanical analysis. Int. J. Prod Res. 10(l):35-51, 1972. Biology Society, 13-17, 1985. Medicine and Engineering in of the IEEE Annual Conference Proceedings of the Seventh 3. Logan, S.E., Vannier, M.W., Bresina, S.J., and Weeks, P.M., Wrist kinematic analysis using a 6 degree of freedom digitizer. 11. Maulucci, R.A., Optimal Workspace Design. Technical Report, National Aeronautics and Space Administration, Contract NAS9-18514, Lyndon B. Johnson Space Center, Houston, TX, 1993. 88-91, 1986.Design News 10. Bak, D.J., Electromagnetic monitoring quantifies motion behavior. 9. Diener, H.-C., Bacher, M., Guschlbauer, B., Thomas, C., and Dichgans, J., The coordination of posture and voluntary movement in patients with herniparesis. J. Neurol. 240:161-167, 1993. 11:55-60, 1992.Med. Biol. Eng. IEEE 8. Bravo, 0., Angular levers and power in the human body. 4:73-79, 1989.Biomech. 7. Pearcy, M.J., and Hindle, R.J., New method for the non-invasive three dimensional measurement of human back movement. Clin. 4. Bresina, S.J., Vannier, M.W., Logan, S.E., and Weeks, P.M., Three-dimensional wrist imaging: Evaluation of functional and pathologic anatomy by computer.Chn. Plast. Surg. 13(3):389-405, 1986. 12. Maulucci, R.A_ Nonstandard Functional Limb Trajectories. Technical Report, National Aeronautics and Space Administration, Contract NAS9-18915, Lyndon B. Johnson Space Center, Houston, TX, 1995.
ng. 2(3):147-157, 1994. Rehab. ETransact. IEEE 13. Eckhouse, R.H., Leonard, E.L., Zhuang, Q., and Maulucci, R.A., Improving reaching in preschool children with cerebral palsy through regulated feedback. tat. 29:209- 211, 1958.Math. S 19. Olkin, I., and Pratt, J.W., Unbiased estimation of certain correlation coefficients. Amer. ng. 28(5):411-416, 1981.Biomed. ETransact IEEE 16. Sherif, M.H., Gregor, R.J., and Lyman, J., Effects of load on myoelectric signals: the ARIMA representation. 15. Flanagan, J.R., and Rao, A.K., Trajectory adaptation to a nonlinear visuornotor transformation: evidence of motion planning in visually perceived space. 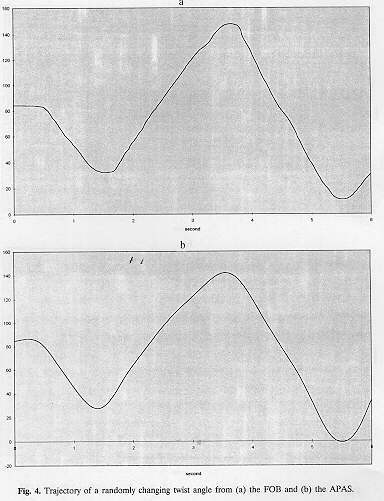 J. Neurophysiol, 74(5):2174-2178, 1995. 14. Isenberg, C., and Conrad, B., Kinematic properties of slow arm movements in Parkinson's disease. J. Neurol. 241:323-330, 1994. Generated on 4/20/2019 3:19:15 PM (PST) ADI/HQ/GBA/2019/ARIELCLOUD/v3.0.2018.0126.